No acceleration in sea level rise in 150 years. None. Just the normal post ice-age trends. Obama promised, and he delivered. Really? You make outrageous claims and then you waste a lot of taxpayer money giving grants and loans to very questionable operations that later declare bankruptcy... and you declare victory? And I thought Trump was laughable. Glad someone else is pointing out the government's own NOAA data demonstrates that "sea level rise" is a total crock. The reason NOAA (originally the U.S. Coast and Geodetic Survey) began keeping this data (more than a century ago in my location, longer at others), is that it is used to define the seaward boundary (mean high water) between private land (fast land) and federal / public land (ocean/submerged land) under the federal law and law of most states. In my location there has been no deviation since NOAA first began keeping the date more than a century ago. Yeah, but ANY DAY NOW it's going to be a catastrophe. The seas will rise another hand-span by 2100, and then where will we be? We should be fitting people with permanent flotation devices at birth. No acceleration in sea level rise in 150 years. Sea level rise is faster now than any time in the last twenty-seven centuries. See Kopp et al., Temperature-driven global sea-level variability in the Common Era, PNAS 2015. At current rates, sea levels will rise about a foot over the next century; however, as surface temperatures rise, ice cap melt will accelerate, meaning that sea level rise is expected to accelerate. I'll go with my lyin' eyes. On Facebook I have a friend who keeps posting a slogan about how Obama saved us in the face of entrenched and "unprecedented" Republican opposition, racism, etc. Asked to specify what he saved us from, and by what action, he just keeps talking about entrenched Republican opposition. I only wish the Republicans had opposed more effectively; I might still have my old affordable health insurance. Of course, the other possible view is that Obama tried to save us but was ineffectual, and therefore the sea levels are somehow still rising catastrophically and it's the Republicans' fault. Only the sea levels are right where they were all along, just like the president's "accomplishments." It's a puzzlement. Texan99: Only the sea levels are right where they were all along, just like the president's "accomplishments." That is not correct, as can be seen in the chart provided in the link in the original post. I live at sea level, have lived near it all my life. No noticeable change, certainly nothing to get hysterical about. Texan99: I live at sea level, have lived near it all my life. No noticeable change, certainly nothing to get hysterical about. Sea level rise various considerably from place to place for geological reasons. 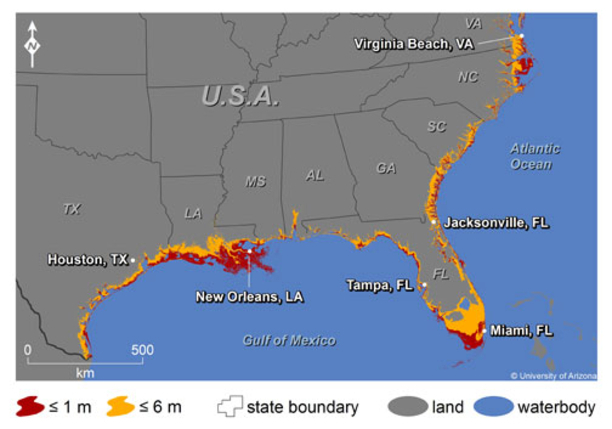 However, rising seas threaten many coastal areas, such as Florida and Bangladesh. You're citing a MODEL as proof? It's not real, like all the other global warming nonsense, it's based on assumptions, predictions and inputs, not actual empirical data, what little data there is is always cherry picked to "confirm" the sensational alarmist results they want. "Garbage in, garbage out." 1905 to 2015 which is equivalent to a change of 0.46 feet in 100 years." The accompanying NOAA graph shows a straight line absolute increase over time, like all the other NOAA charts. If it were to measure an increase in rates it would be flat. Despite the empirical data, I've heard university professors say with a straight face, based on the IPCC nonsense, that our area will get six feet of sea level rise by 2100. Totally delusional. I've jogged the same beach path for 35 years--if what all the hystericals were saying was true, that path would be under 2 feet of water by now. Yet every day I go running, it is still right where it was. The reason hystericals can get people to buy into this fraud is that no one ever goes outside any more. You know, "into nature." Instead, they sit in their air-conditioned offices, or at home playing computer games, and have no clue what is happening in the real world. If they did, they also would recognize all this climate change propaganda is nonsense, it's completely made up. Jim: You're citing a MODEL as proof? The claim about the rate of sea level rise is based on a "statistical synthesis of a global database of regional sea-level reconstructions," in other words, scientific data. Jim: This is the actual empirical data for my location, from NOAA's own website: "The mean sea level trend is 1.41 millimeters/year "
The rate varies in different geological locations. The mean rate of change is about 2.7 mm per year. Jim: The accompanying NOAA graph shows a straight line absolute increase over time, like all the other NOAA charts. If it were to measure an increase in rates it would be flat. It's a linear trend, so of course it's flat — by definition. Jim: if what all the hystericals were saying was true, that path would be under 2 feet of water by now. The rate of increase is expected to accelerate, largely due to increased ice melt. But even if it were true, you are breathless about a foot in one century? When you have fresh water problems, the death of Western Civilisation, rising sexual assault rates in European cities, due to - oh, you know, the bad attitudes of lacrosse players - massive debt, and jobs lost to automation, you are seriously alarmed by a high-estimate chance of a 1-foot rise in sea level in 2020? Assistant Village Idiot: But even if it were true, you are breathless about a foot in one century? The rate of increase is expected to accelerate, largely due to increased ice melt. Sea levels are expected to rise about 80-100 cm by 2100 — assuming humans take some efforts to limit their greenhouse gas emissions. Here's a map of the southeastern U.S. for consideration. Obama never succeeded in any public project undertaken as a community organizer except for the Motor/Voter campaign to register more Democrats for elections. The Altgeld Gardens restoration went bust. The schools that he and Bill Ayres spent millions "improving" are still disasters, and the U. of Chicago assessment at the time decided there was no improvement at all. All the legislation supposedly constructed by him during his congressional run was actually the work of others, then handed to him by Senate leader Emil Jones Jr. to enhance his career, making him few, if any, friends in that body. In short, his entire career after his dubious term at Harvard which was also manipulated by PTB, was a sham. And so it goes. The "measured" sea level rise over time is measured in many places. Oddly in a lot of these places there is no or minimal sea level rise and and many of these places there is measurable and in some cases considerable sea level rise. What is often not mentioned is subsidence. The land at a lot of these measuring stations is sinking this is especially true for islands. Everyone in the AGW believing community knows this. Everyone knows that the most accurate measurements of sea level rise over the last hundred years is very low and quite consistent. That means whatever is causing it does not coincide with the supposed AGW theory. To not acknowledge this and to knowingly exclude measurements that don't show any increase in sea level rise rates while including measurements from known areas of subsidence of the land is dishonest. Pure and simple. As you point out, scientists are quite aware of tectonic uplift or depression. Accounting for these effects, and others, overall sea level is rising. The historical rate since 1870 was about 1.7 mm per year, while the current rate is about 2.7 mm per year. See Bindoff et al., "Observations: Oceanic Climate Change and Sea Level" in The Physical Science Basis. Contribution of Working Group I to the Fourth Assessment Report of the Intergovernmental Panel on Climate Change, Cambridge University Press 2007. So Zachriel, if the science tells us that there is nothing to be alarmed about, why do you alarmists proliferate fear about sea level rise? Which "climate scientist" stood up and smacked down the most recent and ludicrous claim made by Nat Geo that the waters will rise half way up the Statue of Liberty? You were here attacking every snippet which questions the credibility of the alarmist Global Warming claims, nipping at the heels of rationality and real world data, in order to keep your disastrous meme going. Alan Robertson: if the science tells us that there is nothing to be alarmed about, why do you alarmists proliferate fear about sea level rise? Actually, the science tells us that sea levels will rise about 80-100 cm by 2100 — assuming humans take some efforts to limit their greenhouse gas emissions. Alan Robertson: Which "climate scientist" stood up and smacked down the most recent and ludicrous claim made by Nat Geo that the waters will rise half way up the Statue of Liberty? Don't know about such claims, however, Liberty Island sustained substantial damage from Hurricane Sandy and was closed for nearly a year for repairs. As sea levels rise, this will become a problem for preservation. If there were anything substantial to your claims, anything at all, then you would have no need to make claims as if the damage from Sandy, or the subsidence in Florida were related to Global Warming. The truth is not on your side, so you employ subtle lies to support your agenda. The claim was that the Statue of Liberty was too high to be affected by rising sea levels. That is clearly not the case, as is already subject to storm damage. Alan Robertson: or the subsidence in Florida were related to Global Warming. If sea levels rise, they will inundate densely populated areas of the planet. So what, sea levels have been rising since the end of The Little Ice Age and before that, sine the end of the last glaciation. There is nothing we can do to stop it and there was nothing we did to start it. Are your climate posts here a part of your job, do you get paid for "climate communications"? What will those climate scientists come up with next! Yes, sea levels and climate have changed due to natural causes. Sea levels have been much higher than at present, and much lower than at present, at various times in Earth's history. Alan Robertson: There is nothing we can do to stop it and there was nothing we did to start it. They are pulling this crap out of their asses et al. Dr. Morner has been studying the sea levels for years and this is what he says. His work on dowsing is also well-known. An ad hominem which calls into question someone's scientific views when that person is being cited as a scientific expert is pertinent. Nope. Your rationalization digs you deeper into your hole. You can't match the message, so you attack the messenger. That's straight out of the propagandist's tool kit. You've already exposed yourself. You are entirely too practiced in deception. Alan Robertson: You can't match the message, so you attack the messenger. You cited an interview which begins with an appeal to authority, so pointing out that the scientists also supports water dowsing is clearly relevant. Mörner claims there was no sea level rise from 1940 to 1970, which is incorrect. However, if you want to point to an actual research paper, by Mörner or others, we'd be happy to take a look. That's not true. I haven't cited any links or papers, at all. What I have pointed out is that you continuously resort to logical fallacies and incorrect statements to support your position. I also asked you if your "climate communications" here is part of your job description, but you failed to answer... which is likely an answer. Alan Robertson: I haven't cited any links or papers, at all. You are correct. You were responding on a sub-thread concerning an interview with Nils-Axel Mörner. Alan Robertson: What I have pointed out is that you continuously resort to logical fallacies and incorrect statements to support your position. It's not a fallacy to point out problems with an appeal to authority. However, if you want to point to an actual research paper, by Mörner or others, we'd be happy to take a look.